One snowy holiday morning in an old European city, an American man leaves his shabby hotel to meet a local woman who has agreed to help him search for an apartment to rent. Greg Baxter's clear-eyed first novel tells the intriguing story of these two people on this single day. Told in an affecting and intimate tone that gradually expands in scope, intensity, poetry, and drama, THE APARTMENT follows the coupleacross a blurry, illogical, and frozen city and into a past the man is hoping to forget, and leaves them at the doorstep of an uncertain future. 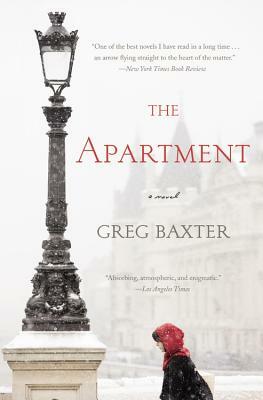 A complex meditation on America's relationship with the rest of the world, an unflinching glimpse at the permanence of human guilt anddespair, and humankind's lust to cure violence with violence, THE APARTMENT is also, and above all, a novel about the bravery and mystery of friendship and love.